Are you a good example of health and vitality? A good working definition of physical fitness includes cardiovascular endurance, muscular strength and endurance, flexibility and freedom from pain. A well-rounded fit person is very capable and has few physical limitations. What do you consider your strengths and weaknesses when it comes to fitness? Your answers to the questions in this article will help you see which areas need more of your attention. You'll also find resources that will help you develop better fitness in each category. 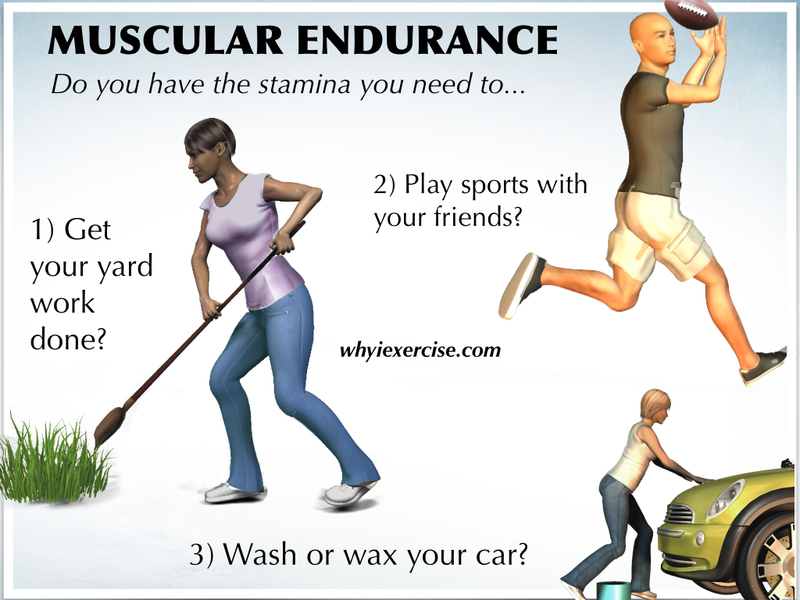 How long are you able to exercise vigorously without stopping? This depends on your heart’s ability to supply blood to working muscles and the muscles’ ability to use the oxygen in the blood. 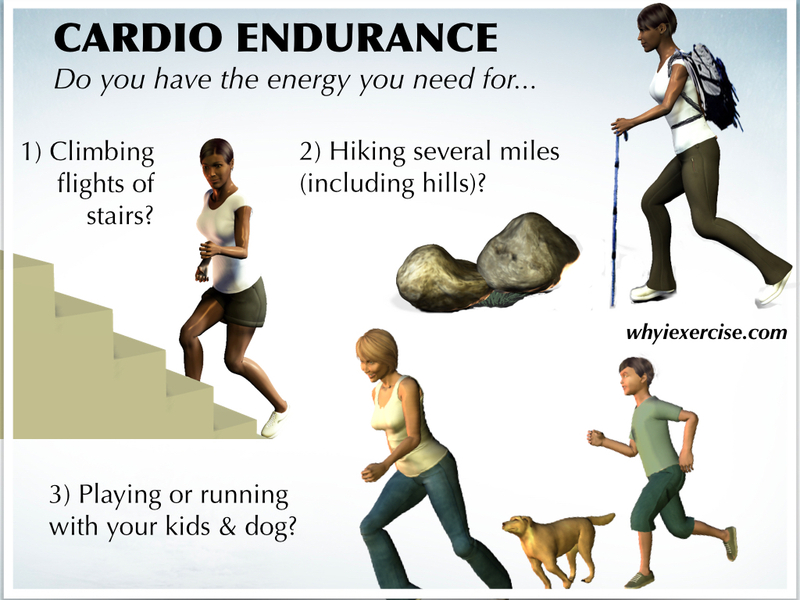 As you can see below, many everyday activities depend on a fit cardiovascular system. 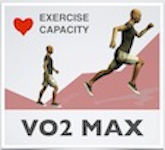 You can find out more about cardiovascular endurance and it's relationship to health and longevity in my article about VO2 Max. Answer the questions with this 1-5 ability scale. Fitness tests: The Rockport walking test will give you a VO2 Max measurement based on your heart rate after a 1 mile brisk walk. The Cooper Test will give you a peer based fitness score from your best effort at a 1.5 mile run. Goals: Work toward being able to exercise vigorously for at least 30 minutes, and reach at least an average level of cardio fitness for your age. For a general guide to progress to this level of fitness, see my free exercise program. Workouts: My article on high intensity interval training (HIIT) has introductory and intermediate level training routines. HIIT is a proven, efficient method to improve your cardio conditioning. 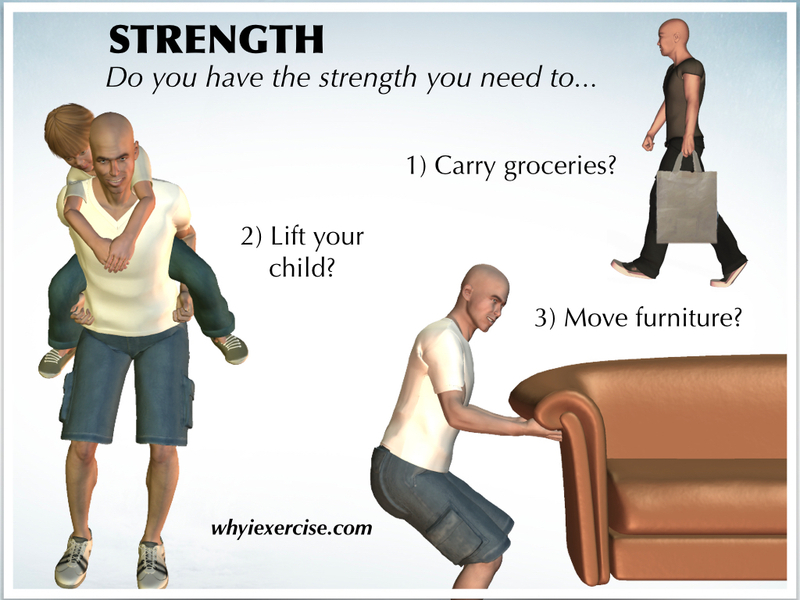 How easy is it for you to push, pull or lift heavy objects? Strength requires powerful muscular contractions and good coordination between muscle groups. Good muscular performance also includes the ability to work consistently over a period of time. How well are you able to resist fatigue and participate fully in sports and active hobbies like dancing? Goal: Aim for average strength or greater for your age group. Find out how you measure up with the fitness tests below. Fitness tests: The Cooper Test includes upper body strength testing and charts for comparison to your gender and age group. Also see my article on abdominal strength testing. Workouts: 6 free home exercise programs are available to help you develop your strength and muscle endurance. You will be able to train your upper body, lower body, back and core. See my physical therapy exercises for a more gentle introduction to strengthening. How would you rate your ability to move your joints freely without strain? Good flexibility is helpful in all activities. It allows you to squat, bend, and reach, for example, with a full range of motion. 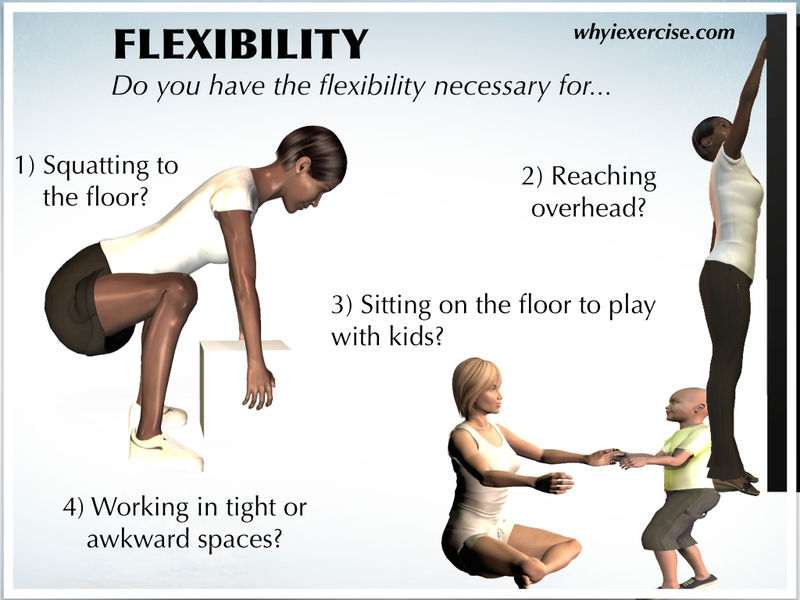 Maintaining and improving your flexibility is helpful for muscular performance and injury prevention. Goal: For most of us, the more flexible the better. Lifestyles that require a lot of sitting have tightened up muscles in the majority of teens and adults. Workouts: The home stretching exercises article includes a convenient introductory routine for the upper and lower body. 2 other routines focus more specifically on regions of the body: Back stretching exercises (includes hip stretches) and shoulder stretching exercises. Pain is common but it is not normal. How much does pain affect your work day, hobbies, family time and restfulness? Resources: First of all, please see your health care provider and follow their instructions if you have significant pain, an injury or any medical condition. Physical therapy exercises and lower back exercise may be helpful if you have issues with your muscles and joints. I hope this article gave you a realistic and useful perspective on the definition of physical fitness. A 1.5 mile jog / run for runners and more athletic types. The Cooper Test also measures upper body strength with a maximum push up test. 1000s of people were tested in the research, so you will get a fair comparison to people in your age group. This simple test makes it possible for non-athletes to find their VO2 Max. Walk 1 mile for time, and enter your heart rate into the fitness calculator. 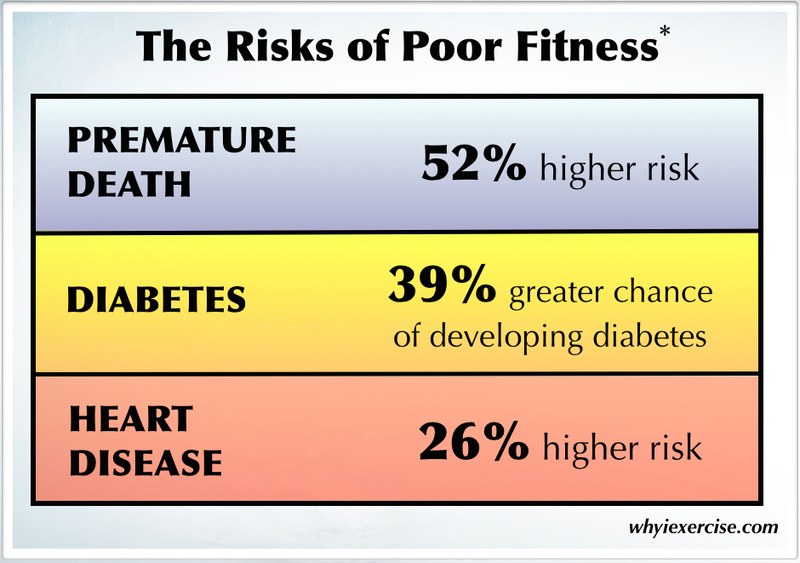 The better your score, the lower your risk for future health issues. Analyze your results from the Cooper Test and the Rockport Walking Test. See the average VO2 Max for your age group and find out how much you need to improve your fitness to lower your health risk significantly. Personal health and fitness directly relates to your quality of life, affecting your decisions, activities, opportunities, and more. Compare the effects of active and inactive lifestyles. TV time has a greater impact than you might expect. Return from definition of physical fitness to physical fitness tests.